SANAA, Yemen — A Saudi-led coalition fighting Yemen's Shiite rebels expressed on Saturday its regret and pledged to hold to account those responsible for "mistakes" in a deadly airstrike it carried out last month that killed dozens, including many children, drawing wide international condemnation. The coalition's statement comes after its investigative body, known as the Joint Incidents Assessments Team, found that an August airstrike conducted in the northern Saada province hitting a bus carrying children in a busy market involved "mistakes," including failing to take measures to minimize collateral damage. At least 51 people, including 40 children, were killed and 79 others, including 56 children, were wounded in the airstrike. The statement carried by the official Saudi Press Agency said the coalition accepts the findings of its investigative body and that "it will take all the legal measures to hold accountable those who were proven to have committed mistakes" once it officially receives the findings. It also pledged to coordinate with Yemen's government to compensate civilians. Mansour Ahmed al-Mansour, JIAT's legal adviser, said earlier the airstrike was launched based on intelligence that senior Houthi rebels, a legitimate military target, were on the bus. He noted however that the operation involved errors, including a delay in carrying out the airstrike and another in issuing a no-strike order. He called on coalition forces to take legal procedures to ensure accountability and provide reparations for civilian victims. He also urged the coalition to review its rules of engagement and ensure forces' commitment to them. Last week, Human Rights Watch released a report criticizing JIAT's investigations into the coalition's alleged violations saying they had fallen short of "international standards regarding transparency, impartiality, and independence" and failed to identify a "clear way" to provide reparations to civilian victims of the airstrikes. Yemen's civil war pitting the Saudi-led coalition against Iran-aligned rebels, known as Houthis, has been raging for more than three years. The coalition backs Yemen's internationally recognized government of Abed Rabbo Mansour Hadi and aims to restore it to power. The coalition has faced criticism for its campaign of airstrikes that has killed civilians and destroyed hospitals and markets. 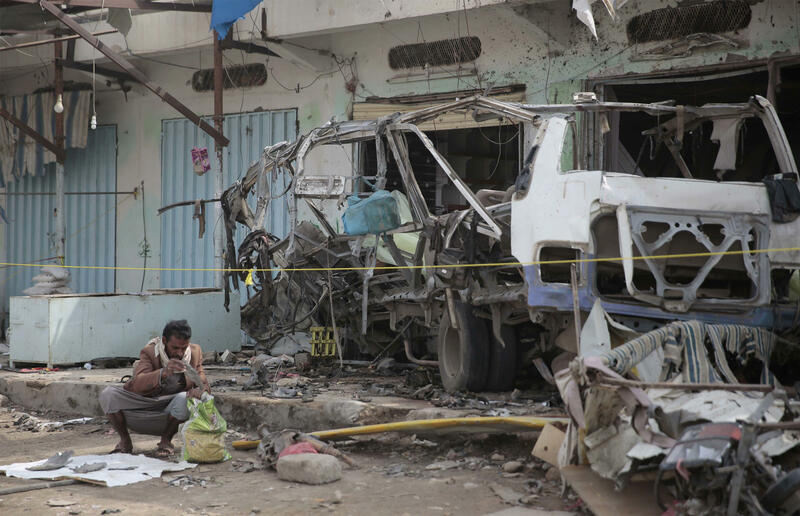 The Houthis, meanwhile, have been accused of using land mines, killing and wounding civilians. They have also targeted religious minorities and imprisoned opponents. The rebels also often attempt cross-border attacks on Saudi Arabia and have targeted the kingdom's vessels in the Red Sea. On Saturday, the rebel-run Al-Masirah TV channel reported that the Houthis targeted a Saudi "battleship" off the kingdom's southern province of Jizan in response to an earlier airstrike that killed at least five fishermen off Yemen's coast, blamed on the Saudi-led coalition fighting the Iran-aligned Houthis. The report did not provide details on casualties. There was no immediate comment from the coalition on the incident. Houthi attacks on Saudi ships prompted Saudi Arabia's state oil company, Aramco, to temporarily suspend oil shipments in late July before resuming them later after taking security measures.